Singapore's national water agency has put a stop to all fishing activities at two reservoirs in the Central Catchment Nature Reserve until further notice after motoro stingrays were spotted recently. PUB also said designated fishing grounds at Lower Peirce Reservoir and Upper Seletar Reservoir will be closed as a precautionary measure while the agency conducts investigations and removes the stingrays. The animals, which originate from South America and are not native to Singapore, were spotted at Lower Peirce Reservoir last week. A Lianhe Wanbao reader claimed to have seen 60 there. Mr Huang Hongguo, 70, told the Chinese-language evening daily that the number of stingrays in the reservoir has increased greatly in the past four to five years. The Straits Times understands the barbed freshwater stingrays may have been released into the reservoir by members of the public. "PUB strongly urges the public against releasing animals into our reservoirs and waterways," it added, noting that it has removed 75 motoro stingrays from these bodies of water since 2015. PUB has also been working with the National Parks Board and the Agri-Food and Veterinary Authority of Singapore (AVA) on Operation No Release, which seeks to raise awareness of the harm caused by releasing animals into reservoirs and waterways. "Our reservoirs and waterways serve, first and foremost, as a source of water supply, and PUB's core interest is in safeguarding Singapore's water quality and ensuring water safety," the agency said. PUB also advised the public to exercise caution at the reservoirs. It has allowed fishing and other water activities at designated reservoirs to allow residents to better cherish and appreciate water as a precious resource for Singapore. But some have abused this. 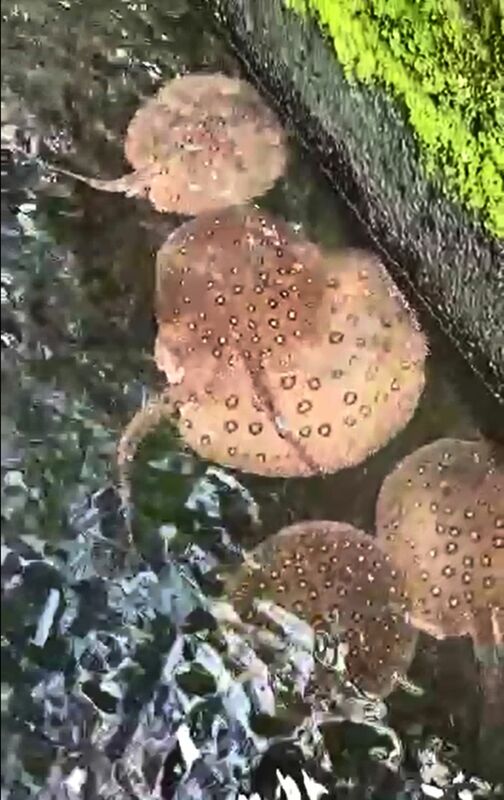 Motoro stingrays were first netted and identified in Upper Seletar in 2010 by scientists from the National University of Singapore's Raffles Museum of Biodiversity Research, the first record of them setting up a colony this far from home. The motoro stingray has a stinger at the base of its tail that can deliver venomous stings that can cause extreme pain and even death. However, they are generally shy and attack only if threatened. Wildlife conservationist Ben Lee, 55, told The Straits Times that although motoro stingrays do not necessarily pose a danger to other fish, they "still affect the food chain in the ecosystem" as they compete with other fish for food. Mr Lee, who is also the founder of non-profit environment group Nature Trekker, agreed that the main cause of non-invasive species in Singapore is illegal release by owners of exotic pets. Last week's sighting was not the first time motoro stingrays have been spotted in Singapore's water bodies. He had bought them from an aquarium earlier in the year. In 2010, motoro stingrays - said to be the size of dinner plates - were found to be breeding in Upper Seletar Reservoir. Other non-native animal species which have been spotted in Singapore's waters include the golden apple snail and snakehead fish, an aggressive predatory fish. In 1991, snakehead fish made the news when they attacked young swans in the Botanic Gardens. Most of them are either impulse buyers who have grown tired of the exotic pets or those who think that they are doing a good deed by setting these wild animals free, he added. "Some of them might not know that it is illegal or how it might affect the environment," he said. It is an offence to release animals, including fish, into reservoirs and waterways, with offenders risking fines of up to $3,000. More signs warning against the release of non-native animals in parks and public spaces might be helpful, Mr Lee suggested. Members of the public who spot people releasing animals into water bodies can call the PUB hotline on 1800-225-5782 or AVA's 24-hour hotline on 1800-476-1600.